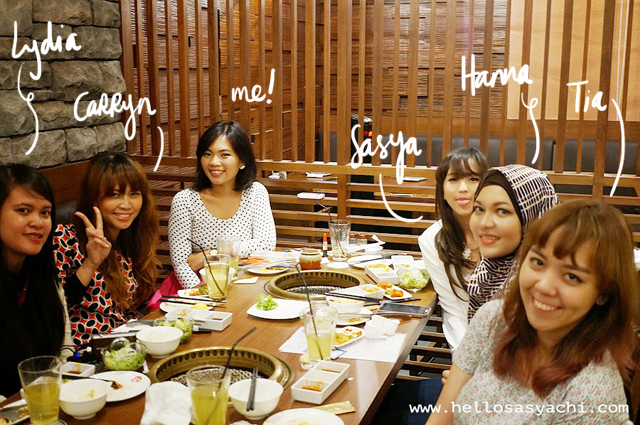 Last Saturday I went for a lunch with some blogger friends at KINTAN Japanese Yakiniku Restaurant. Japanese food is my favorite food after nasi goreng (I'm a truly Indonesian at heart), so it was a happy day because we had a very delicious yakiniku for lunch. Yaaay! 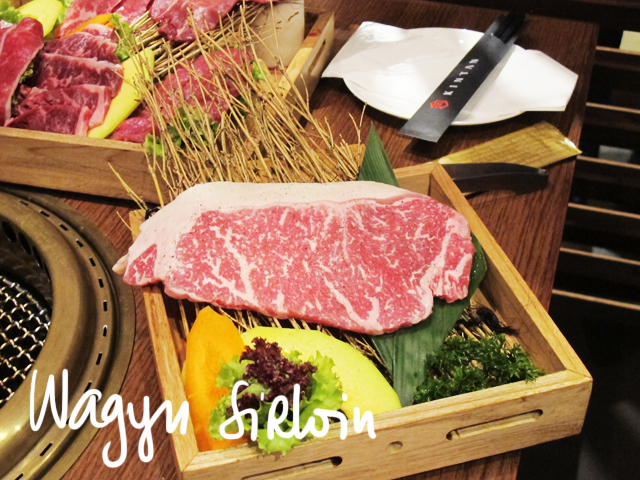 Just by writing this post is making me want to have a bite of the yakiniku. 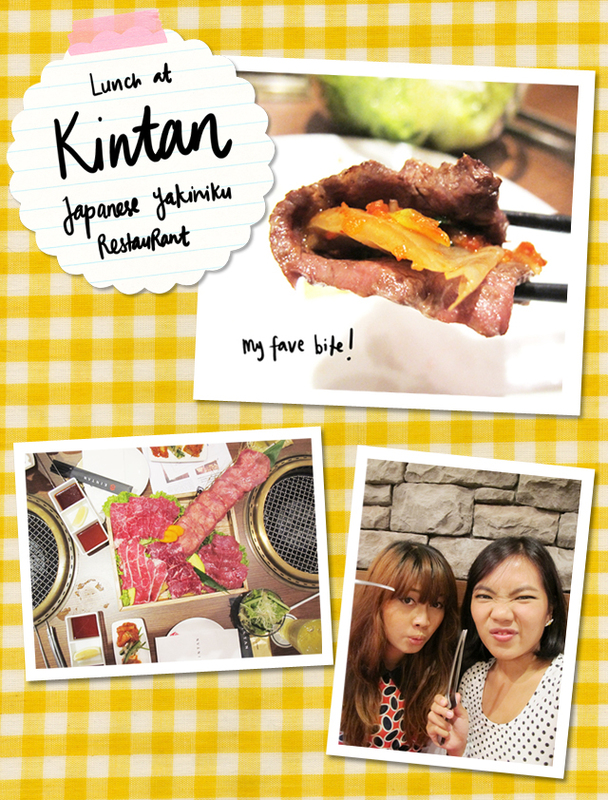 So KINTAN Restaurant just opened their first outlet in Jakarta, at Pacific Place last month. It is on the 5th floor, right across Pancious and side to side with Shaburi restaurant. The interior makes it feels so Japanese with all the kanji displays. Each table has a stove with ami (the wire mesh) and a tonggu, the tweezers for cooking. 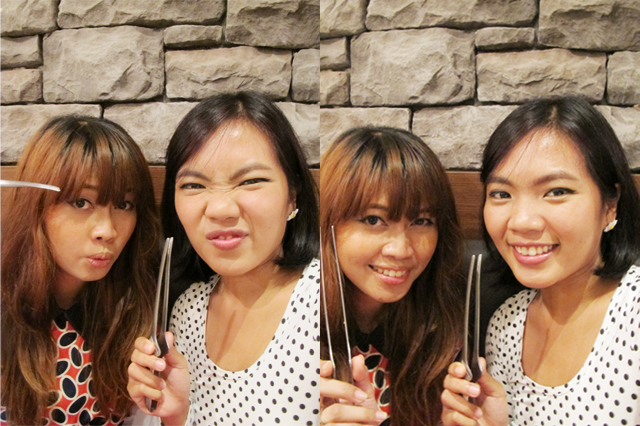 Yeeesss, its a self cooking restaurant, love it! 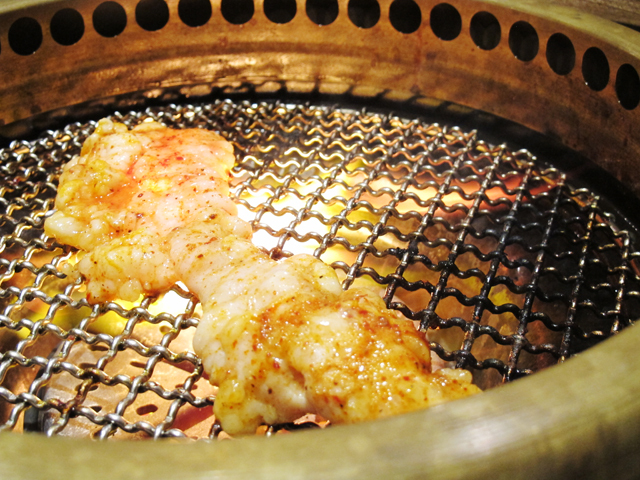 There are several yakiniku set available in KINTAN Restaurant. 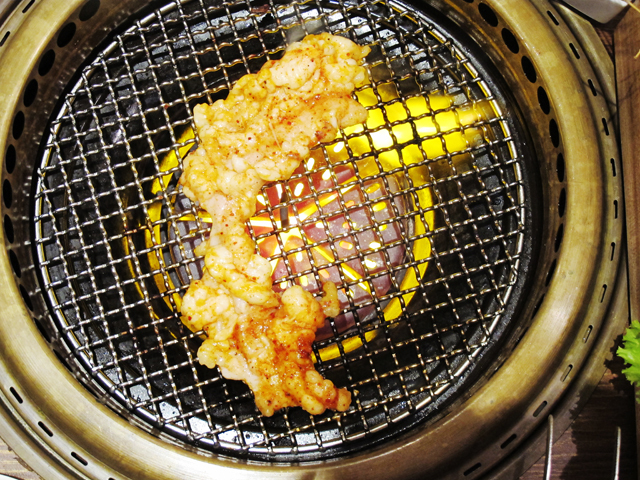 We had the Manpuku Yakiniku Set (for 2), which picture is displayed above. 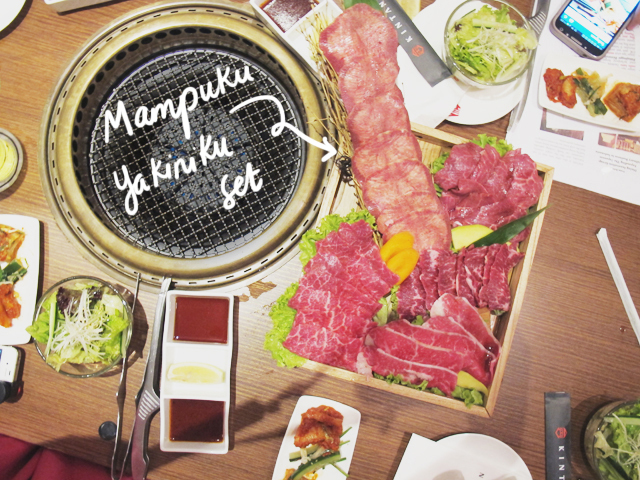 The Manpuku Yakiniku Set is actually one tray full of 5 kinds of beef, Kintan jou kalbi, taki shabu kalbi, arami, gyutan, and rosu. 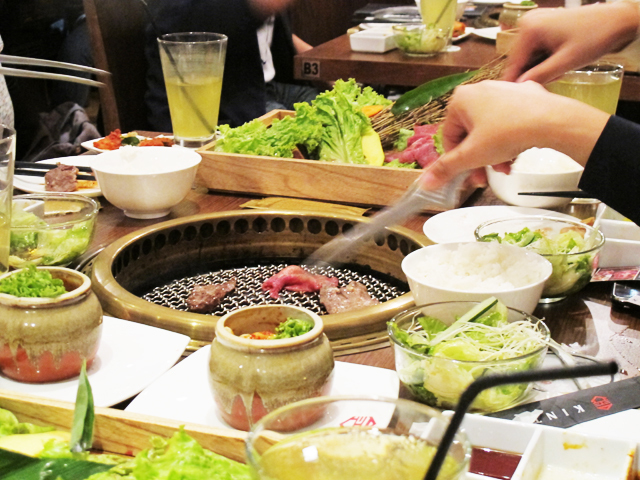 This yakiniku set comes with 3 kinds of sauce, rice, kimchi, salad, and ice cream for dessert. 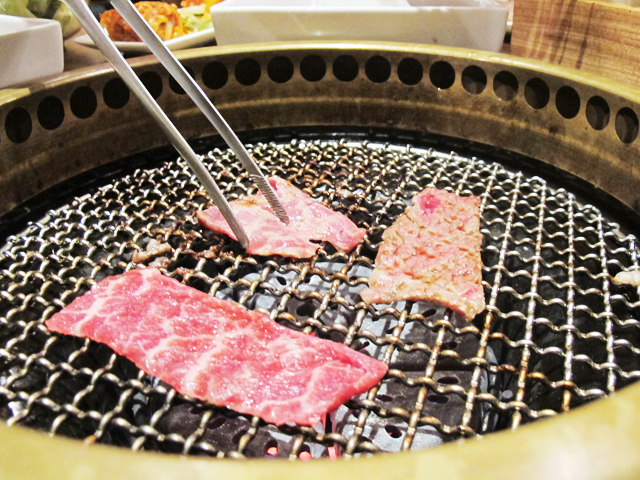 If you see the picture below, the one that stands out of the tray is a row of beef tongue (middle part). 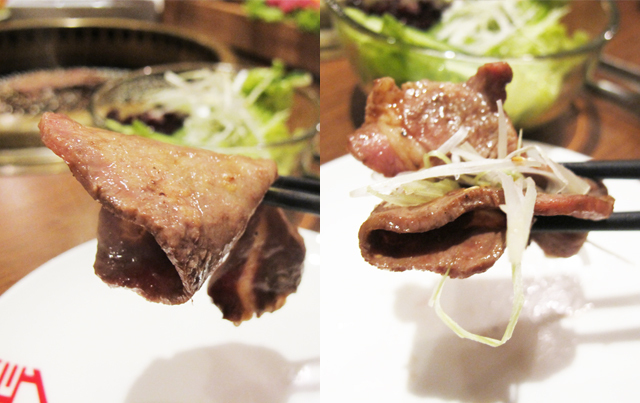 I usually don't like beef tongue, but this one is an exception. It tasted so good, a bit chewy but still tender. 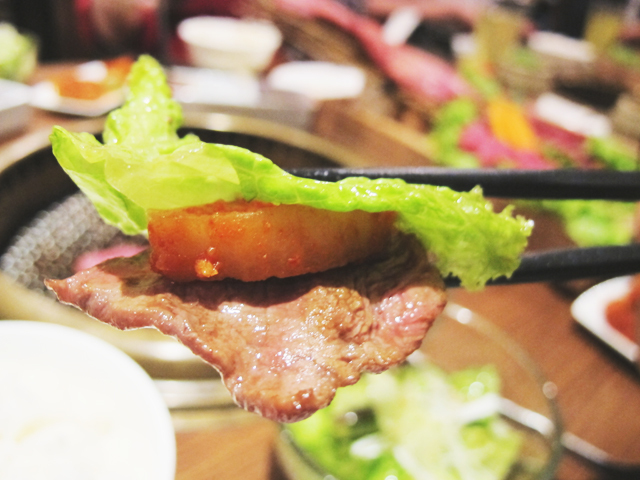 The beef tongue goes really well together with the lemon juice. 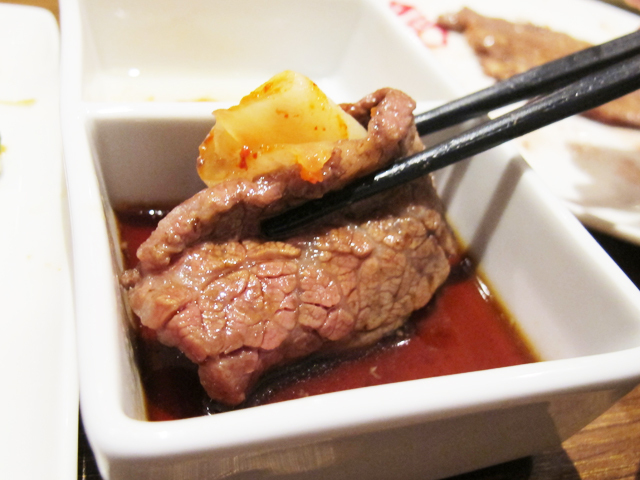 For the other beef, I really like to dip it in the spicy miso sauce and put a slice of kimchi between the beef. Hmmmm........ Gosh I feel hungry right now. 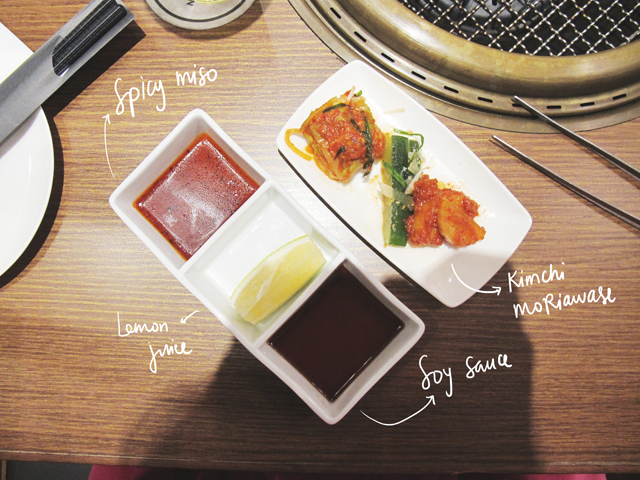 Here are the 3 sauces for the dipping and some kimchi. The spicy miso doesn't taste spicy at all, which was surprising me because it tasted sweet and a bit salty. The soy sauce is a bit bland, but you can still taste the saltiness lightly. You don't have to worry about the sauce, because the beef is already delicious by its own. Oh, the kimchi is my favorite, so good! 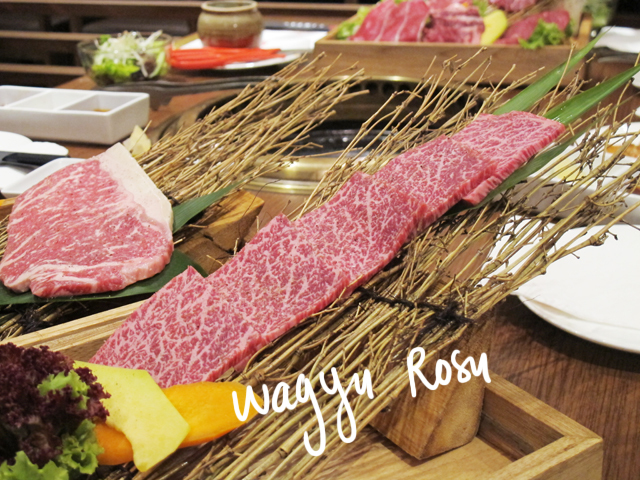 Besides Mampuku Yakiniku Set, there are also Wagyu Rosu Set and Wagyu Sirloin Set. Luckily, we had a chance to see the Japanese chef demonstrate how to cook the beef in the right way. So after the fire is on, you should wait around 2-3 minutes so the stove become hot, unless the beef would stick to the ami. When the beef is on the ami, wait until its 60% cooked or when the juices come out. Flip the beef and wait for another minute until its fully cooked. I like the beef to be very juicy, medium well is perfect. I had a bite of this wagyu sirloin and it just melted in my mouth. SO GOOOOODD! Here's the bomb, its called Surprised Hormone. It looks sooo eeeewww... because it is cow's intestine! They call it Surprised Hormone because people usually gets surprised by how long the intestine is. Surprised Hormone is already seasoned, so you only need to cook it. Set the fire medium and lay the Surprised Hormone on the ami, the smooth/sleek/slimy part should go on the bottom while the fatty part facing up. Then when its half cooked, cut the Surprised Hormone into smaller pieces by using a scissor. It tasted so rich, a bit spicy, be prepared for the chewiness. 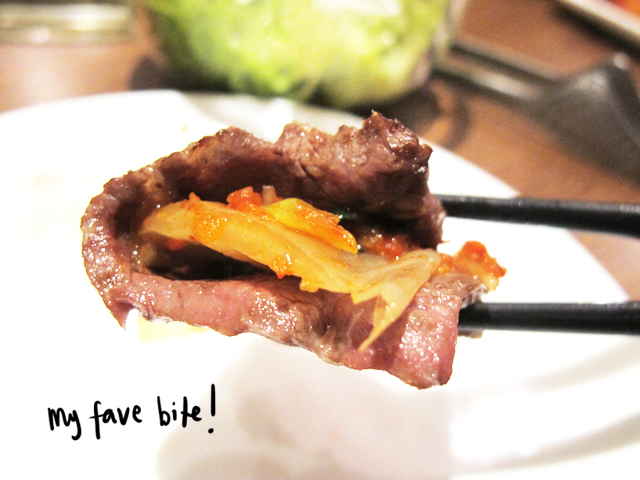 I'm telling you that this Surprised Hormone is one of the best recommendation at KINTAN Restaurant, make sure to have one! I was trying to cook the Surprised Hormone. It was really challenging hahaha. My amateur cooking skill shows up very strong when the Surprised Hormone was being cooked. The fire was up and everywhere, we were terrified hahaha, but I made it! Sasya and Tia really liked the Surprised Hormone, so this duo ate up all the yummy pieces. 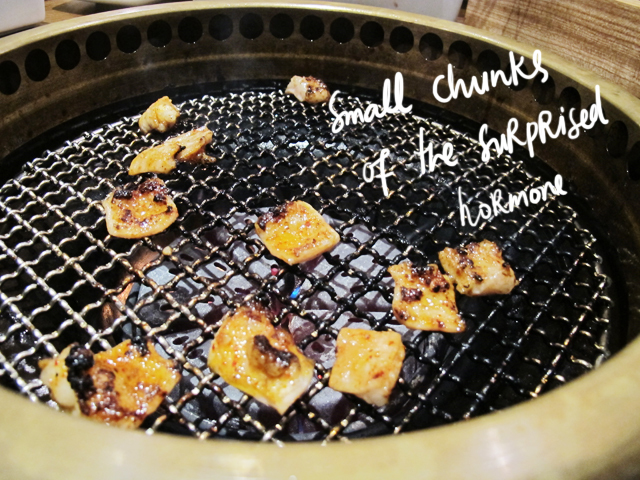 Picture tells everything, so here are my favorite bites of the yakiniku. The beef of course, so tenderrrrr soooo delicious that you don't need any sauce! Enough said. Find out more about KINTAN Restaurant here. Yah, aku harusnya kemaren ke sana juga tapi gabisa gara2 ujian T__T Looks so good!